With too many celebrations and events like that new Star Wars: The Force Awakens trailer and “Back To The Future Day” abound, we missed an opportunity to RECAP some of the more memorable shows that appeared in our radar this past week. Thankfully, the weekend is still ripe for reruns, and this past week’s episodes of The Flash and Arrow were certainly full of character developments and intense family themed moments that put a new wrench or two into the lives of our favorite superheroes for the DC Television Universe. So if you’re itching to find out what went down and play catch up, here’s the SPOILER FILLED Recap double entry for the third respective episodes of The Flash Season 2 and Arrow Season 4. Over at Central City for The Flash’s newest episode entitled “Family of Rogues”, Barry Allen once again comes into contact with the Snart siblings, aka Captain Cold and Golden Glider. Unfortunately for The Scarlet Speedster, there’s more at play when their father Lewis Snart resurfaces, forcing Cold to work with his estranged daddy after he uses his sister’s life as a bargaining chip for his cooperation by putting a bomb in her head. Team Flash works with Lisa Snart/ Golden Glider to keep her safe while Flash begrudgingly works with Cold to put a stop to Lewis’ plans. They succeed and Lewis is put down by his own son, giving Barry some more insight that Leonard Snart/ Captain Cold isn’t such a bad guy after all. Meanwhile, Joe West reunites with his estranged wife Francine, who’s also the mother of Iris and wants to reconnect with her family once more. He has difficulty in reconciling with his wife after her drug-riddled past, and confides with Barry on how to tell Iris the truth that her mother is alive. Ultimately he does, and Iris is more understanding and forgiving for her father’s secret. As for Team Flash and Jay Garrick, they manage to successfully build a “Speed Cannon” that stabilizes one of the 52 portals leading to Earth-2… And Martin Stein experiences another seizure attack that sees him combust into blue flames like Firestorm. Overall, this episode was all about family and resolving some inner issues between the Snart and West clans, as well a propelling Captain Cold’s future position as one of the stars of DC’s Legends of Tomorrow. It’ll be interesting to see how Iris interacts with her mom in future episodes, and Martin Stein’s strange power burst should be addressed in this coming Tuesday’s episode. 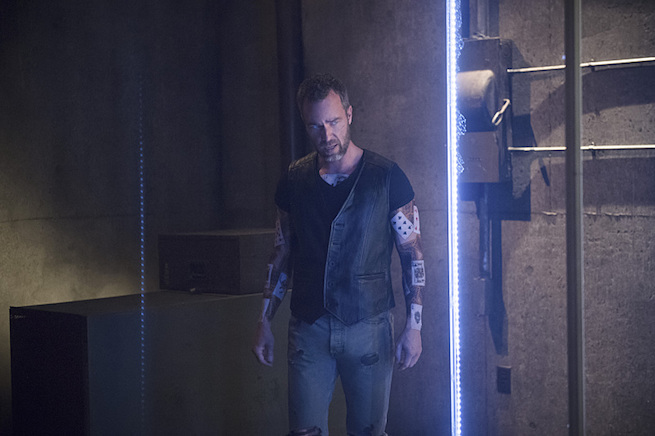 Over at Arrow, the episode “Restoration” has a double meaning and tackles two plot threads that have been lingering for a while – the resurrection of Sara “Canary” Lance and Oliver and Diggle’s fractured relationship following the events of Arrow Season 3. Thankfully those issues were wrapped up with this episode… But one of them came at a terrible price. When Damien Darhk hires metahuman “Double Down” to take care and dispatch Team Arrow, only the three original members in Oliver Queen, Felicty Smoak, and John Diggle are in Star City to deal with the threat. 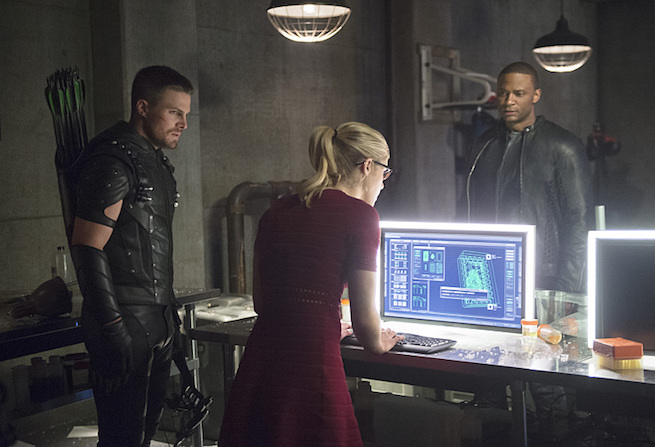 Unfortunately Ollie and Dig still have to resolve their differences, which forces Felicity to make the two work things out for them to work effectively as a team once more. They do just that, and Oliver now knows Diggle’s efforts to find HIVE and get answers on his brother Andy’s death. Meanwhile, Laurel Lance/ Black Canary and Thea Queen/ Speedy travel to Nanda Parbat to seek the aid of Thea’s father Malcolm Merlyn, aka the new Ra’s AL Ghul, for two things – to cure Thea’s bloodlust and resurrect the dead Sara Lance via the Lazarus Pit. 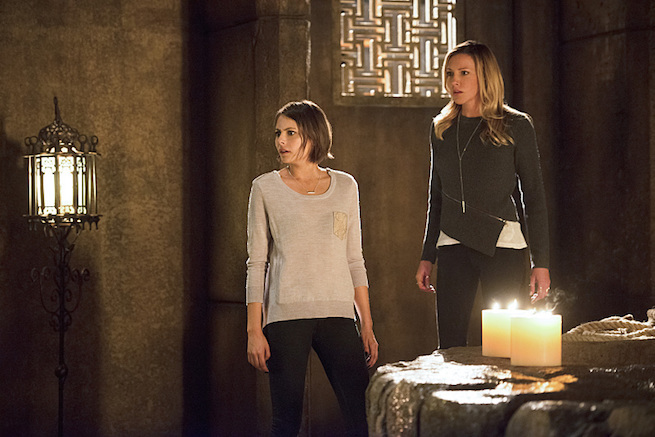 All except Laurel are not in favor for bringing Sara back, especially the departed’s ex-lover Nyssa Al Ghul. However in order to prove that his intentions are sincere to his daughter and clear her conscience, Malcolm reluctantly allows the resurrection to take place, and Sara comes back to life… Albeit in a savage and different way. Even with the resurrection successful, Malcolm faces a new problem – Nyssa tampers with the Lazarus Pit and renders it unusable, making any other future restorations impossible. How this will affect future events remains to be seen. For now, Sara Lance is alive… But how will the others react to her resurrection, and can she come back as her old self? What more can be said? Definitely the episode every fan of Sara Lance/ Caity Lotz was waiting for… And she’s back! Catch new episodes of The Flash on Tuesdays, and Arrow on Wednesdays in The CW!